I Have a set of – 1847 Rogers Brothers Silverware with The Letters “IS” and “Eternally Yours” printed on each piece. What is the value of this set? From Patsy in Richmond, Virginia. I have 4 pounds of 1847 Roger Brothers IS. I was just wondering what it was worth. I would like to know more about it before I decide whether or not to sell it? From Tim in Pacific, Missouri. The first thing we tell people about 1847 Rogers Brothers Silver is that the 1847 is NOT the manufacturer date. This is the founding date of Rogers Brothers that they include in the hallmark of all their silverware. The “IS” stands for International Silver who has owned Rogers since 1898. The point is that neither of these markings gives any indication about the purity or value of the silver. Make sure that you are aware that NOT all sets and pieces by Rogers Brothers are sterling. Some pieces are silver plate. Sometimes people automatically assume that old silver pieces are sterling, but silver plating techniques have been around since the 1800s. The most important item to know is whether or not your silver is sterling. No matter who you sell to, usually sterling silver is more valuable than silver plate, stainless steel, copper or some other non-precious metal. If you have sterling, check to see if you have a complete set and if any pieces are broken or damaged. If you have odd and end pieces Arch Enterprises, precious metal refiner will pay for the silver. We would need to know the exact weight of your sterling silver. That means if you have knives or weighted serving wear, we would want that weight separate. Please feel free to start the process and fill out our Request Estimate Form. Otherwise for non-sterling, check to see what items are going for on eBay to get an idea about the value. The prices on eBay we found for “Eternally Yours Rogers Brothers Silverware” range from $235 -$295. But also keep in mind that these are large 52 piece to 72 piece sets in good condition, and some of them in their original boxes which makes a difference in their resale value. * Please keep in mind that we are not a antique dealer and cannot give estimates based on the value of collectable, rare or vintage antiques. As a precious metal refiner, we only give estimates based on the weight of items and the amount of precious metal available for recovery. I have a broken up set; one is a three pronged fork, and all pieces when rubbed with cloth leave a black residue….in fact, by just touching these and holding them a little, I now have black all over mostly, the tips of my fingers…..could these be worth anything? I would like to donate them to a charity….thank you. I HAVE A FULL 52 PIECE SET OF 1847 ROGERS BROS. INTERNATIONAL SILVER COMPANY HERITAGE EDITION IN ORIGINAL BOX STILL IN PLASTIC SLEEVES IN EXCELLENT CONDITION DO YOU KNOW ITS WORTH? How do I know if my set is sterling? Hi @carolyngorman! We do not estimate based on the number of pieces you have. We estimate based on the weight of sterling silver content. 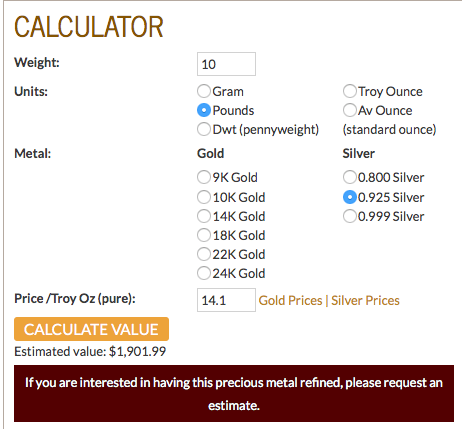 We would recommend weighing the pieces you know are sterling silver and plug into our calculator here: http://www.archenterprises.com/silver-gold-calculator.html. Then weigh pieces that may be weighted or filled with other material or have stainless steel blades, like many knives. You can refer to this blog post for more info: http://www.precious-metal-refining.info/where-to-sell-sterling-silver-flatware-set/. Hope that helps! How much does the silverware set “1847 Rogers Bros E.P. KOREA” cost or is worth? How much is my gold plated Rogers Bros Korea 49 pcs set worth? I have this exact set as pictured and described above. How does one tell if this is actually “silver” or not? I have 12 place settings + most serving pieces in the original box. I have a 5 piece set marked 1847 rogers bros E.P on copper wmmts 2/49 ??? Some one can help me with this? just how much they are worth. How can you tell if your Rogers Bros IS Rembrance set is silver plated or sterling silver? I had a 52 piece 1847 Rogers Bros silverplated set that was stolen from my grandmother’s house. It was in good condition. They left only the woooded box. I need to file a police report of the value. How much is it worth? # 9. Your Teapot is Electroplated. Keep it and enjoy. Value is minimal at this time. I have a 1847 Rogers Bros silverware set in a wooden display case, I’m wondering what the value of this set would be? It’s a 48 piece, I also have some serving spoons etc that match. There are some markings on them: stainless and IS. We recently went to a yard sale and got a whole box of silverware stating the 1847 Rogers and some have an anchor symbol on them. I do not know to tell if it is silver plated of sterling silver. I do know that some has ware on them and a golden look is now showing. Does this mean anything? I have a complete 10 piece flatware set of rogers 1847 flatware IS, in original box. What would be the value of this? rogers&bro.exquisite 4670 cake plate what is its value? i found it at our backyard yesterday. its an 1847 Rogers bros IS FLAIR…. is this a real silver? do you know the worth? I have a 44 piece silverware set from 1847 Rogers bros. I/S reflection. I was wondering what it is worth? Would like to sell odd & end pieces of Wm Roger silver plated silverware. Have 4 serving pieces. 3 spoons and 1 spoon pronged. No case – just loose pieces. How can I find value? I would love to have the 3 prong fork to complete my set. The IS on your silver stands for “International Silver” (company). This company was a silver plate company and known for and specialize in silver plated tableware. That being said, what you have is most likely plated silver and not sterling. Since your pieces are current enough to be marked with “IS” then they should also be marked to indicate sterling with something like a 925 or SS marking. So the value would not be in the silver content but instead as the silverware as a set. Thanks for the question! Since your items are silver plated, we cannot give a value based on the silver content. Thanks for your question, you would be better off working with an antique dealer or reseller of silverware. Rodgers & Bro. reinforced plate IS. The note in the box says Daybreak. I would like some information on this set. I have some rogers bros silver ware but it doesnt have the IS on it, just a monogramed A is this a different company? 1947 rogers bros IS. Is this worth anything? I have 67 pieces mixed of the 1847 Rogers Bros. Remembrance. I have a teapot Marked Rogers silver 1883 and the number 24 62. Would this be sterling or plated? Thank you. I have a 42 piece set,in the box, with IS next to the name. I also have a 3 piece carving set with what looks like deer horn handles.Can you tell me the value? Hi Clestine — Unfortunately without some more information we cannot give you an estimate on your items. For your 42 piece set, we would need to verify that what you have is sterling or not. Just the marking of “IS” does not tell us if it is sterling as indicated in the blog post. For the carving set, because the handles are not made of precious metal we would not be able to provide a return on the deer horn handles that you describe. In our experience, most of the blades on these sets are made of a different, harder metal such as stainless steel. Please contact us if you find that your pieces are in fact sterling: http://www.archenterprises.com/contact-us.html. Thanks! Please fill out our Request Estimate form here http://www.archenterprises.com/contact-us.html and indicate if what you have is sterling. HI EA — We are not an antiques dealer nor do we specialize in sterling silver pieces. As a precious metal refiner, we only give estimates based on the weight of items and the amount of precious metal available for recovery. If you had a whole set of flatware and serving pieces, it may be worth sending in so that we can run a test on one piece. However, with just the one piece it probably would not be worth it. We would recommend consulting an antique dealer or someone that has a specialty in sterling silver. Thank you for your question. I have some pieces I would like to identify. I have a cream ladle with a marking of “1647 Rogers Bros”, followed by a circular stamp (I cannot tell what it is) and XS Triple. Another piece, a fork, is marked ” Pat’18 and WM Rogers flanked with either a butterfly or a German eagle. The last pieces, 6 forks and 6 knives, are marked “Sterling Pat 1915”, a small square with an M and a lion carrying a shield with a W on the shield. Do you have any idea what these pieces might be worth or anything about the markings? Unfortunately since we do not specialize in the hallmarks of silverware, it is hard for us to say what you have is sterling or not just by the descriptions you gave. “Rogers Bros” pieces can be either sterling or plated. Your other pieces that actually have “Sterling” marked on them seem like they may have a better chance of actually being sterling. We would recommend taking your pieces to a local antique dealer that may specialize in silverware. Then contact us with the weights of the pieces that you know are sterling. Thank you for your comment. You have the patience of a saint to keep politely replying to these same people seeking antique appraisals when the previous answers make it clear that being in sleeves or a box or 100 years old or a 2 year old broken piece is irrelevant to your purposes On behalf of the dim witted public I apologize and have no questions. Thank you for an informative site & valuable service. I have a single piece of the Roger bros. silver. Its a odd an ends piece I’ve tried to find it but I have its a type of fork.. But I’m just trying to find out what its worth.. I found it when I was arrow head hunting. I don’t wanna get rid of it.. I’ve had for a year an a half. Its s memorial piece to me cause its the day I meet my fiance. So I don’t wanna sell it cause its what I used to propose to her.. So someone text me at 1417-396-2193. An ill send you a picture of the piece I have… Thank you for your time.. Doodle squirrel. What a sweet story about your proposal. Even if your piece is sterling, we typically do not take one piece to refine, as it is not worth the cost for us. If it does not specifically indicate sterling with an “S” “SS” or “Sterling” marking, you probably do not have a sterling and it is most likely electroplated silver. If you do want to send us an image, you can upload one on our contact form here http://www.precious-metal-refining.info/request-estimate/. Please also include the weight. But I would hold on to it as well! I have a set for 12 of roger bros,heritage,international silver in case I understand 1847 is not the real date,but what is the date for this set ive seen 1947 and1953 whats right? Hi Vickie. Sorry but we are not specialists in the makers or manufacturers of silverware and have no idea what year your silver was made. Does it have a date on the case? Sorry we can’t be much help. Thank you for your question. Without knowing forsure if what you have is sterling or not, we cannot give an estimate. What we have found from searching “1847 rogers bros. IS, [first love]” is that the First Love sets were silver plated and not sterling. If you find that your pieces are in fact sterling, then weigh them and send us a Request Estimate form. Best, Arch. We are not the experts on silver hallmarks, however “EPNS” stands for “electroplated nickel silver” in which case would mean that your piece is silver plated. Thanks! I want to complete a set of 1947 Roger Bross IS silver ware. Where can I get it? I would start with Ebay and go from there. There are lots of online sellers with their own stores and with Ebay stores and listings. Good Luck! I have a few pieces of rogers bros IS Heritage silverware in excellent condition. I can’t find any information about these items, especially the Heritage marking. I work for an auctioneer who mainly does estate auctions. he gives me the things that do not sell at auction, and these pieces were some of those things. I would appreciate your help in finding what if anything they worth,and where I could sell them. I really can’t tell but don’t think they are sterling silver. However my wife thinks they are because she cleaned them up and say’s that the more she scratches into them the shinier they get. So for the first time I want my wife to be right. These are tough ones for use since we are not experts in silverware. I am guessing that if your auctioneer didn’t want them that they are not sterling. Even if they are silverplate however they can fetch a price on Ebay or reseller sites like this one http://www.antiquecupboard.com/ShowPattern.asp?pattern=Heritage&Mfg=1847+Rogers+%2F+International. Good luck! Rogers Bros pan with Lid worth? I have a sugar spoon that has what looks like an anchor before and after the word ROGERS and the letters AA after the last anchor. It has scrolling along the handle and the bowl of the spoon has a somewhat shell shape with some patterning along the base of the bowl. It has been in the family a very long time and I do not have any other pieces. Thank you for any information you might have about it. Hi Jan. We are not experts but if you do not see any markings that indicate sterling such as a 925, S, or SS — then there are good chances that you do not have a sterling piece. However we cannot be sure unless we test at our labs. If you had many pieces it may be worth sending in one or two to test, however with just the one you may want to try somewhere locally first. Best wishes — Arch. I came across my Mother’s (cb Gmas) Silver set. I see the “1847 Rogers” no IS or SS. There is however XS Triple. What can you tell me about this set? Guessing the pattern doesn’t matter but I’d so, it’s a floral, like rosebuds. Hi Christin, Thank you for your comment. From what we have found about Rogers Brothers silverware marked with “xs triple” that these pieces were plated three times in silver. While this does make the piece heavier, it still uses an electroplating technique and uses a very small amount of silver for the plating (even though it was done 3 times). So we unfortunately would not be able to offer a return for the silver in your pieces. Thank you! How can you determine if what you have is silver or not? I know this is Dec 1, 2015 but I am looking for someone that can help me with this spoon :like” piece. It might be a small ladel. My grandma had it, then my dad and now me. I seems to me that is must be worth something and more than I see on here. It doesent have the same markings. Just seem to be from something different than what I see on all the websites. Wonder if I can send you a pic of it?It does say 1847! If you think it might be worth wild to check it out please email me. Who knows I might to rich! Yea right. Depending on how much your piece weighs even if it is sterling, it probably would not fetch you a great price just for its silver value on its own from someone like Arch as a precious metal refiner. However, if you have say a sterling silver gravy ladle, can resale for $100 – $300. Here is a listing that we found that may help you, but they are only listing STERLING here http://bit.ly/1QwgLxr. If you would like there is an image upload feature on our contact form here http://www.archenterprises.com/contact-us.html and we can take a look. Thanks! I have a complete Eternally Yours 1847 Rogers bros IS Silver Tea and Coffee Service Set with tray – includes large silver serving tray, tall spouted pot (assume for coffee) and shorter spouted spot (assume for tea), a creamer, sugar, and one other piece that may be also sugar but missing lid. What is this worth? How do I get this appraised and possibly sell it? It is beautiful but not something I want to polish/maintain. My understanding is it is mid to late 1800s antique as explained to me when given as a wedding present. Also what is best method to safely clean and preserve this silver set? If you pieces are NOT sterling, then you would need to sell them as silver plated pieces which can still be valuable to a reseller, but not for their silver value. We can’t give too much help on cleaning other than what we have found is that aluminum foil and baking soda may work http://on.fb.me/1YmYYi8. Here is a link to our silver calculator http://www.archenterprises.com/silver-gold-calculator.html. Hi Sheri. Your set is definitely worth something. If all your pieces are sterling we are looking for the weight of just the sterling silver. Sometimes there are knives with weights or steel rods in them that would throw off the weight of sterling silver that we are after. On another note, if your set is complete, it may fetch more value as a complete sterling silver set on places like eBay. As precious metal refiners we would only pay on the silver content and not take into account the completeness, rarity, or condition of the set. What is the Double Plated and what is the worth compared to plated? Thank you. Thanks for your question. Some manufacturers have begun using terms like, “double plated” or “triple plated” on their silver plated items. Generally, this implies a slightly thicker layer of silver plate, which can improve the life of the silver plated item, since silver plate does wear off over time. However, because silver plate is so thin in the first place (the HEAVIEST plate is only 0.00125 inches thick! ), it makes virtually no difference in the value of an individual item. At Arch Enterprises, we can only refine silver plated items if you have more than 50 lbs worth, simply because there is so little silver per individual silver plated item. Like have a 93 piece dinner set in original box. The words IS and First Love are engraved on ea piece. Please give me some information on this set. Thank you. We have set of 6 very small spoons (perhaps baby spoons)that are Rogers Bros and have a Script also that says Silvery Mint. Is there any way in knowing how old these may be? We also have a baby spoon with a bent handle that says. Pat. Jan 4 1910 and the initials W.R.O. Si il est en argent Conbien je pourrait le vendre? But what does EPNS stand for. Is my little cup worth anything besides a cup. I know there are collectors of children’s cups. I also have one with a trademark and a crown on bottom. 1888 FB Rogers Silver Co Taunton Mass Quadruple 107 sweet child’s cup. Any inkling on this one? I have a 64 piece of Roger Brothers silverplate First Love set. Was just wondering on an estimate pricing it would value? I have two pieces that my husband’s parents left us. One is a serving tray with handles, ornate, and on the back are these markings: Reflection, 1847 Rogers Bros., IS, 9280. I have a rogers “first Love” silverware…it was my mothers, and I want to add more to the set…but when I look on ebay, not all of them are stamped “first Love” on back of silverware…are they different? I have a set of 6 dinner knives and forks and 9 teaspoons all marked 1881 on them. the knives and forks are both wrapped in their own fabric case with a tag “The Family Plate for Seventy Years 1847 ROGERS BROS Silverware” is there some significance to the seventy years? and how much do you think they may be worth? Ihave an 1842 silver spoon with the word Mother on it, is it worth anything? It was given to me by my mother? I am trying to find out what type of metal was used on the rodgers remembrance silverplated flatware. Its about 70 years old. I want to engrave something under the tines of the forks and was told if the fork was brass or aluminum, that using it for food would be an issue. Would there be any way of finding out if this is the case? I HAVE A FULL SET OF SILVERWARE. ON THE BACK OF EACH PIECE IS “1847 ROGERS BROS IS FIRST LOVE”. I WOULD LIKE TO SELL MY PIECES BUT DO NOT KNOW THE VALUE – THE SET BELONGED TO MY MOTHER IN LAW & EACH PIECE WAS BOUGHT AS A GIFT FOR BIRTHDAYS AND SPECIAL OCCASIONS. THE SET INCLUDES ALL SERVING PIECES AND EXTRAS. I have been collecting vintage silverplate for years – just because it’s beautiful. Can you tell me more about where it is produced? ie .. Rogers Brothers, Nobility Plate, Prestige Plate, etc.. were these pieces produced in the United States? In which states were the factories located? Just a curiosity question – but one that I have never been able to find an answer to. I have a 1847 Rogers Bros IS fork that I have tested and found is sterling..but there is no mark? I’m quite certain it is sterling, how much would it be worth? I have 9 pieces of Rogers extra plate pieces of flatware I would like to donate to you. I have no use for these items and thought you may be able to sell them to someone who would want to complete their set. I am not looking to make any money off of these. I simply would like to donate them. Please contact me telling me where I could send them to if you are interested in these items. Thank you! My email is: geescott62@gmail. Hello! I have a 125 piece (I believe) Rogers Bros dining set and I’m not exactly sure how to go about selling or appraising them. since late 19th century. Any way to determine their value? I have a meat platter with the following labeling on the back — is this sterling silver or silver plated? Hi. I’ve read all of your posts and I’m so impressed that you’ve taken the time to answer all these people about their flatware. It’s amazing. I have 1847 Rogers Bros IS Flatware. Named First Love. There’s 63 pieces the blade of the dinner knives say Stainless Steel but the rest of the pieces don’t say what they are. I wish I could send you a picture. I’m trying to figure out if they are sterling or silver plated. They are all enclosed in a beautiful Oak box with brass hinges. Is there a way to tell if they are sterling or plated. Hahaha…I have my answer. I’m genuinely surprised anyone needs to ask after so many explanations. Perhaps they are hoping their set is magically different! I have mixed pieces of Rodgers Bros silverware I would like to sell. Many show the name of First Love on the back. One says Rodgers 4. I read above that a lady was looking for some 3-pronged forks. I have 5 in my collectiomn. I have a set of Rogers Bros., Adoration. It is a 52 piece set and not sure if they are silver. Any way to tell? The knive blades are marked stainless steel? I have one piece but its look like very old..its look like untique …by the way im from phillipines. I have an Rogers set marked with A1.X1. What does that stand fkr? I have a few pieces of the Rogers Brothers that i bought at a yard sale to use in crafting..mine has a slight pattern on the end of each,but mine has AI after their name but before the copyright circle..i have gone through the questions and did not find anything about that on here..i don’t want to use them until i find out..someone may need them to finish out their set..please let me know if they are important..
i have a flair entertainment set 1847 rogers bros. a product of the international silver company is it real silver and is it worth anything? Found a spoon while metal detecting 1847 Rogers Bro.s. I assume silver plated as it is in pretty bad shape..but I was able to clean of the back to get markings. What are some of the other markings aside from the IS..? Mine appears to have an A &? another letter I cannot make out along with 4 other I assume makers marks? there is a letter B in a circle,something that looks like a crown, some oddball design of wavy origin, and a dot in a circle. I HOPE I’m not repeating a question you have patiently answered ad nauseum & I also hope my questions are not too silly or the answers too obvious!! I’m in the process of going through lots of my family’s (estate) silver items & started to wonder a few things! 1)If a person wanted to sell sterling silverware, & since I’m assuming it’s not pure silver, how does a company like yours weigh and/or separate the silver from the other metal content? Is it possible to separate the silver plating from silver plated utensils? 2) I ran across a fairly old diamond ring (about 80 yrs old) of “unknown” origin.(i.e. no one still alive remembers it) It is set in a metal that is silver like but not quite as shiny. The imprint inside the ring appears to say “Planado” or something very close. I believe it’s of Spanish derivation & may be the word for “platinum” but I cannot find an exact match for translation. I’ve also searched tons of vintage jewery sites & found NONE that refer to that spelling of Platinum on a ring! I will eventually be bringing it to a jeweller to be appraised & then sent to G.I.A to be certified, but I’ve been curious about this for SO long & hoped perhaps, given all the metal you come in contact with, this may be something familiar to you? 3) Finally (whew), if I decided to sell the sterling silverware for the silver content could I take it to a coin shop where I’ve taken coins to sell for their melt value? OR do I take it to a jeweller OR do I send it to YOU? Hi. I may have gotten confused on instructions asking for information under headings “Mail…” and “Website” — my apology, if so. Anyway, contacting you pertaining to your response to Larry Beaty (07-08-2015), who wanted to know the value of an International Silver 1847 Rogers First Love 6pc children’s service he had/has — First Love was, in fact, also produced in Sterling. I have a service for six that includes soup spoons, ice tea spoons, salad forks, tea spoons, butter/jam spreaders, place setting dinner knives, grille forks, pate knives (2), meat forks (2), and serving spoons (3). Sterling in this pattern is extremely scarce — I’ve been working on trying to build my set but have not, to date, located any other pieces; silverplate in First Love appears to be relatively abundant). Thought you might be interested in knowing this. I would like to sell a 10.2 pound,Rogers Bros. IS “Heritage” tray #9492. Can you tell me what it is worth? I am looking for a little history on a piece we picked up. It’s Etched 1952 Florida Womans High Overall Champion, on a Daffodil Silver Serving plate. I looked for sports records back in 1952 and can’t find anything. Any help would be appreciated!